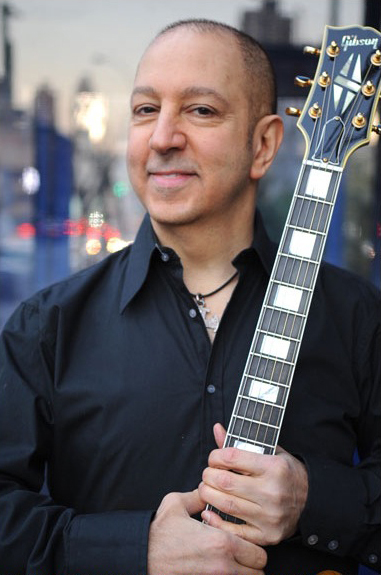 New York guitarist Greg Skaff has an impressive jazz pedigree. A native of Wichita, Kansas, he came to town in the ‘80s and shortly thereafter hooked up with tenor sax great Stanley “Don’t Mess With Mr. T” Turrentine, a gig which lasted five years. There followed playing situations with the likes of Freddie Hubbard and David “Fathead” Newman and a lengthy tenure with saxophonist-composer-bandleader Bobby Watson that involved several tours and a few recordings. More recently Skaff has played in the Ron Carter big band. 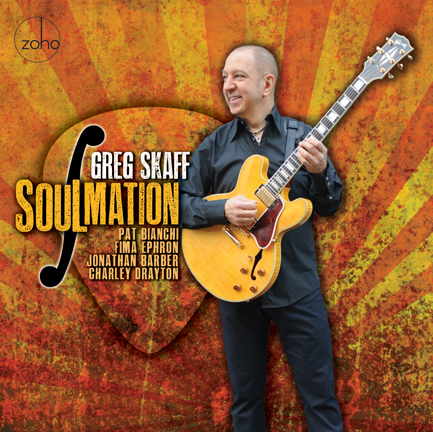 But Skaff is being very honest on Soulmation, his fourth recording for Zoho, following on the heels of 2012’s organ trio outing 116th & Park. The gloriously subversive sound of distorted guitar is as much a part of his DNA, having grown up with rock guitar gods like Jeff Beck and Jimi Hendrix, as is the sound of Wes Montgomery’s octaves, George Benson’s linear burn, Grant Green’s righteous grooves and Pat Martino’s laser-sharp facility. Skaff channels them all, in some capacity, on this ambitiously eclectic project that has his splitting time between two trios  one with organist Pat Bianchi (back from 116th & Park) and drummer Charley Drayton (Divinyls, Keith Richards’ X-Pensive Winos), the other with electric bassist Fima Ephron (a charter member of Lost Tribe) and drummer Jonathan Barber (a member of trumpeter Jeremy Pelt’s current acoustic quintet). Together they traverse moods and grooves in Skaff’s most exhilarating and revealing album to date. Greg Skaff, December 2016. Photography: Melanie Futorian. The unadulterated jazz number Porcupine Hat is swinging out of the gate, paced by Ephron’s insistent walking baselines and Barber’s surging pulse on the kit. Talisman is a ferocious organ trio number that recalls the raw fury of the original Tony Williams Lifetime with Larry Young and John McLaughlin. Staff’s distortion-soaked solo here is absolutely ripping. “I was trying to do something a little more rock than the other two cuts with organ,” he says. Recorded in 2016 at The Bunker Studio, Brooklyn by Nolan Thies; Avatar Studios, NYC by Anthony Ruotolo; and Factory Underground, Norwalk CT, by Kenny Cash.Mixed by Nolan Thies. Mastered by JJ McGeehan at Joan of Arc Park Studio. Photography by Melanie Futorian, Bernard Drayton, Sung Kim. Art Direction and Package Design by Jack Frisch. Produced by Greg Skaff. Executive Producer: Joachim “Jochen” Becker.